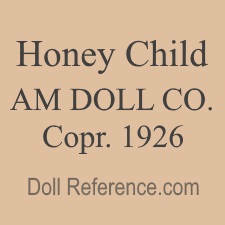 American Doll Company, Honey Child doll, black doll 15 1/2"
The American Doll Company was owned and operated by Bayless Brothers & Company of Louisville, KY USA. 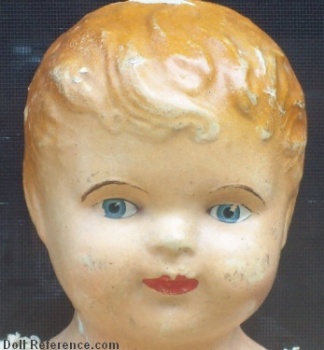 They made both Mama girl and boy dolls and Bye-Lo Baby type dolls. 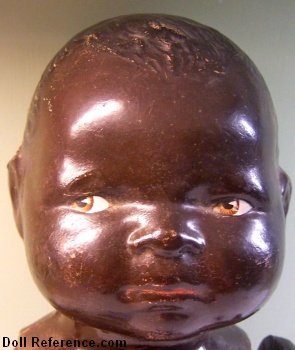 Shown left; Honey Child doll, a Bye-Lo type black baby doll, also came as a white baby doll, 12-15 1/5" tall, composition shoulder head and lower arms or full upper arms in larger sized doll, molded painted hair, brown decal side glancing eyes, closed mouth, cloth body, legs and upper arms, doll marked on front shoulder plate Honey Child, on back shoulder plate Am Doll Co. Copr. 1926. 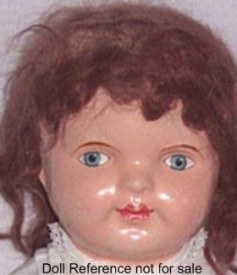 American Doll Company, Girl doll, 20" tall, probably has molded Marcelled curls beneath her wig, composition shoulder head, composition arms, cloth body and legs, decal blue eyes, closed mouth, black cloth stitched on boots over cloth legs. American Doll Company Girl dolls and Boy dolls have been found in various large sizes from 18" to 25" tall, both dolls have molded hair, the Boys hair is all over molded curls, the Girls molded hair is a Marcelled style, if hair is unpainted then it probably originally wore a mohair wig, composition shoulder heads on a stuffed cloth body, composition arms, cloth legs with cloth boots stitched on or papier mache body with papier mache legs with blue or pink painted on boots, both dolls have decal eyes, closed mouth, both above dolls marked Am. 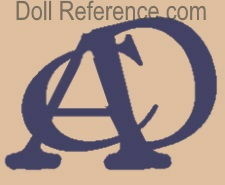 Doll Co.
American Doll Company doll marks AM. DOLL. CO., A.D. Co.